To satisfy the requirements of high registration accuracy，high production efficiency，elegant appearance, Guangdong Magnolia Packing Machinery Co., Ltd. has developed a brand new two-dimensional code/ QR code PM Series Ink-jet Platform , which is applicable for massive ink jet printing with high speed and high precision. The PM Ink-jet Platform is mainly for ink jet printing of different types of packaging products. The Model PMJ have both the functions of ink jet and inspection ,which can effectively reduce the process flow, labor intensity and save space. The PM Series Ink-jet Platform is compatible to the nozzles of different brands. It is suitable for the production of two-dimensional code/ QR code, production date, barcodes and verification code of different types of packaging products. 1. The substrate is separated by high-speed feeder; front lay and pull lay are used at the tail end of the feeding board to ensure the front edge of substrate is parallel to the arrangement of nozzles. 2. Gripper system controlled paper transmission is adopted. 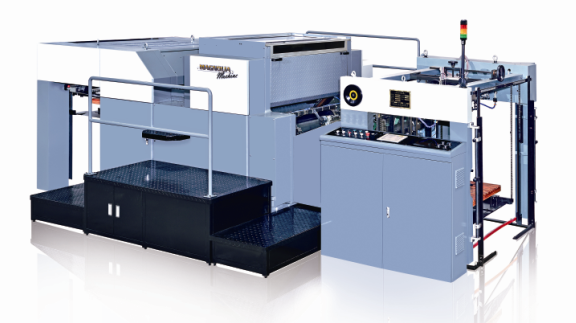 The substrate is delivered from the paper transmission roller to the ink jet roller through the gripper system. 3. The ink jet roller is of double diameter and bigger curvature radius, which makes it suitable for various types of substrate. 4. In order to avoid damage to the nozzle caused by paper drifting when the paper is leaving the nozzle, two negative-pressure suction areas are designed inside the ink jet roller. The negative-pressure areas can be adjusted according to the paper width to ensure the tail end of paper is absorbed closely to the roller surface. In addition, on the roller surface, there are circumferentially-arranged rubber wheels to guarantee that the substrate is controlled during the ink jet printing process. 5. 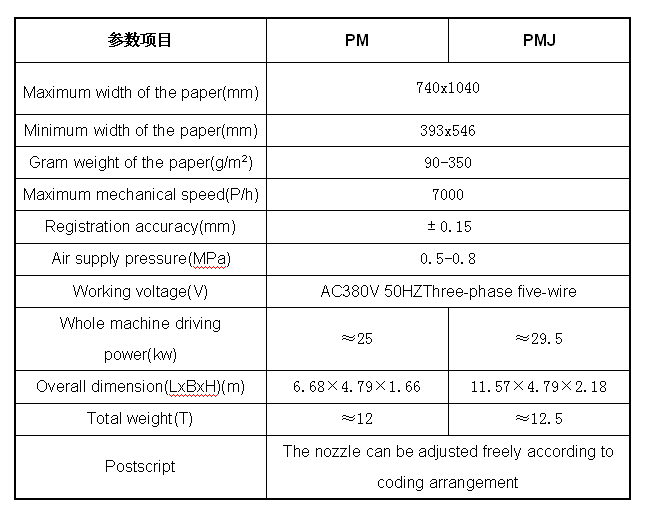 The nozzle can be adjusted freely according to coding arrangement. 6. In case of any problem during the paper delivery, the ink jet holder will rise automatically to avoid damage to the nozzle and guarantee efficient running of the nozzle. 7. Non-stop paper receiver is adopted; UV lamp is optioned if needed.